A Custer film inspired National Park Service historian Robert Utley. We have the late actor Errol Flynn to thank for preserving important pieces of Western history. We have George Armstrong Custer to thank, too—yes, that Custer. Because both men—the legendary Army general massacred at the Battle of the Little Bighorn and the actor who portrayed him in They Died With Their Boots On—greatly influenced the one person who could easily be credited as the “Man Who Saved the West.” That honor goes to acclaimed author and former National Park Service historian Robert Utley. He wouldn’t claim the honor for himself, he’s much too modest for that, but plenty of others recognize his amazing contribution to preserve some of the most historic monuments to the Western experience. Utley’s vision and efforts were in the vanguard of a national awakening that preserving our past is like preserving our soul. So True West turned to him when we inquired into the status of Western preservation—are we doing a good job or a lousy job of saving our history; what more must we do and what pitfalls are ahead; and are we moving forward or backward in cherishing the American spirit? We caught up with Utley as he was leaving on a month-long book tour for Lone Star Lawmen: The Second Century of the Texas Rangers—his 16th book on the West. He kindly answered a long list of questions on where we are and where we need to go. “I am encouraged by preservation of the Western heritage and Western historic places, both on the national and the state and local levels,” he tells True West. But he warns, none of this is easy, and none of it comes without lots of effort, vigilance and pain. 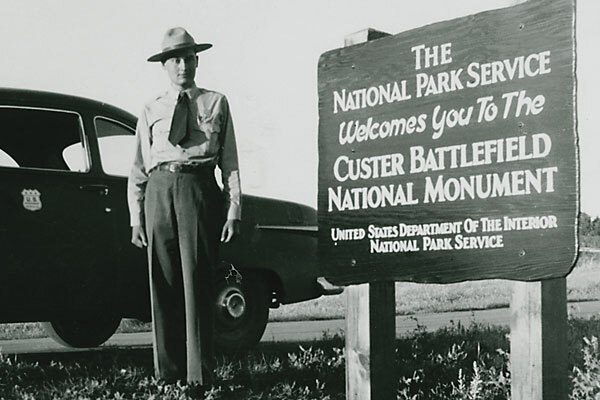 In 1946, he saved up the 25 cents an hour he earned as a drugstore soda jerk and bought a bus ticket to Montana where he visited the site of Custer’s “Last Stand.” The next year, the 17 year old donned a National Park Service uniform and became a ranger, telling the Custer story to tourists. That began a 43-year career with the park service where he left his mark every step of the way. Within a decade of donning his uniform, he became the regional historian for the park service, working out of the Santa Fe office. From 1957-64, he executed an astonishing amount of research and historical background work on what he now calls “my parks”: Fort Bowie and the Hubbell Trading Post, in Arizona; Fort Davis and Chamizal, in Texas; and Golden Spike in Utah. Oh yes, he also worked extensively on the existing park sites of Fort Union and Pecos in New Mexico. It’s easy to see why. Fort Davis was established in 1854 on the site of an Indian village. The Army abandoned it in the early 1890s, and over the next seven decades, many eyed the fort for everything from a Western movie center to a resort. Today, it is considered perhaps the best preserved of all the 19th-century frontier forts and one of the best “Buffalo Soldier” forts in the entire West. Both partially and fully-restored buildings are scattered over its 474 acres, with interpretive displays, an excellent book shop and museum. • Hubbell Trading Post National Historic Site in northern Arizona is the oldest operating trading post on the Navajo Nation. You can literally step back in time and experience this original 160-acre homestead, which includes the trading post, Hubble home and a visitor center with Navajo weavers at work. • Fort Bowie National Historic Site in southern Arizona commemorates the bitter conflict between Chiricahua Apaches and the U.S. military. It’s considered a “lasting monument to the bravery and endurance of U.S. soldiers paving the way for settlement and the taming of the western frontier,” as well as an insight into the clashing of cultures as the Apaches fought to preserve their existence. • Golden Spike National Historic Site in Utah was the place, on May 10, 1869, where workers completed the transcontinental railroad, placing the final spikes in the tracks connecting the eastern and western legs. The event is re-enacted every year on the anniversary. • Chamizal National Memorial in El Paso, Texas, marks the 1963 milestone in diplomatic relations between Mexico and the United States—a treaty that settled a century-long boundary dispute. After a successful stint in Santa Fe, Utley’s next stop was Washington, D.C., where he was named chief historian for the Park Service. He also was director of the Office of Archaeology and Historic Preservation, and finally, he was promoted to deputy executive director, reporting directly to the President of the United States. While there, he was a “key player” in the creation of the National Historic Preservation Act of 1966. He devised the program to implement the act, which was approved by Congress to give grants to states and tribes for conservation. The public, he believes, must pressure the government. He says he sees public interest everywhere he turns—by the popularity of the History Channel on cable TV, where he’s a regular guest; the numerous historical chapters operating in many towns and counties; and the “booming” need to save historic homes and neighborhoods, filled by the National Trust for Historic Preservation. Making Headway, Or Losing It? Utley says Nixon “did not hamper us,” and the Carter administration had a “great” interior secretary in Cecil Andrus, who created wilderness areas in Alaska but was hampered from doing more by Carter’s need to “micromanage” everything. Utley retired in 1980 but kept in touch with the field. He gives “low grades” to Ronald Reagan and his controversial Interior Secretary James Watt, who he calls “a disaster.” Subsequent Presidents don’t get any higher marks: Bush Sr., Clinton (he says his Interior Secretary Bruce Babbitt “should have done better”) and the current President Bush, whose first interior secretary, Gale Norton, “was a catastrophe, and the NPS director, a political crony.” Utley has seen improvements from their replacements, but this administration, overall, isn’t serious about preservation. Utley says those who are serious about preservation must always stay diligent. And just because a place has been “saved,” doesn’t mean it stays saved. Here’s a cautionary tale from one of the West’s most famous historic spots, Tombstone, Arizona. Before folks turn a deaf ear—as we know some will—we hope they listen to what Utley has to say. After all, he is the man responsible for getting Tombstone its “National Landmark” status in the early 1960s, when he was stationed in Santa Fe. “Of course, national significance demands in part what we call ‘integrity’—how well does it represent the past it illustrates,” he says. 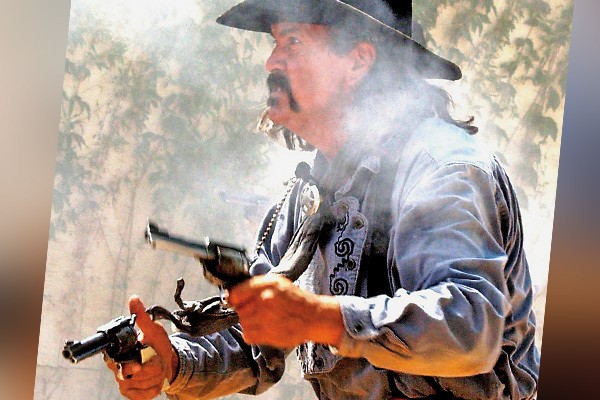 When the landmark plaque was presented to the city of Tombstone, Utley remembers sitting in the bleachers and watching a re-enactment of the Gunfight behind the O.K. Corral. “Over the years, commercialization has taken its toll on Tombstone,” Utley laments. “It has lost much of the integrity that supported its landmark designation—so much so that NPS has threatened to defrock it of landmark status. If that moved forward, it would—I think already has—ignite a political firestorm (True West got some flack after covering Tombstone’s threatened status in 2005). “Nevertheless, I believe Tombstone no longer qualifies and that the Landmark status should be withdrawn. One good reason, other than loss of integrity, is to serve warning on other landmark holders of the obligation to maintain the integrity. Powerful words from a man who has made a powerful contribution to Western history and preservation, a man who knows what “success” feels like when it comes to saving our heritage and hopes others can share his kind of joy. “I roamed among the markers, climbed ridges and descended ravines,” recalled Utley, adding he jumped wildly every time buzzing grasshoppers reminded him of rattlesnakes. The battlefield also embraced a national cemetery for the dead of all wars, and the young man strolled among the markers reading names that mirrored history. Hired the following year by Superintendent Edward S. Luce, himself a former Seventh cavalryman of an earlier day, Bob honed his interest in Custer by serving summers during his college years at the then-Custer Battlefield National Monument (presently Little Bighorn Battlefield National Monument). As an historical aide, he interpreted the park story to visitors during the summers of 1947-52. Utley’s experience with people and sites, as evinced at Custer Battlefield, profoundly influenced his penchant for history and historic preservation, promoting his interest in what would one day be termed public history. Years later, following military service, graduate school and reemployment by the National Park Service, he formalized new standards for the agency’s research and writing that produced contributions of exceptional value to the nation. Specifically, Bob assembled archival documentation on Fort Bowie, the combat post in Arizona that factored in Geronimo’s surrender, and his studies influenced Congress to authorize the site for inclusion in the National Park Service in 1964. Similar work by Utley led to the authorization of Hubbell Trading Post and Golden Spike National Historic Sites in Arizona and Utah, respectively. All of these successes ultimately translated into his appointment as chief historian of the National Park Service and thereafter as assistant director for Park Historic Preservation, tenures affectionately recalled by many as embracing the “golden years” for cultural resources in that agency. Preserving The West, Good News and Bad News. We have much to cheer about when it comes to preservation efforts in the West—and real bragging rights to boot—but there’s also some worrisome problems we can’t ignore. So here’s the good news and the bad news about saving our heritage. The good news is very, very good. National studies have found that conservation is outpacing sprawl throughout the country, but no place more prominently than in the Western United States. In fact, studies show the West is leading the nation, not only in the number of acres being saved from bulldozers, but in the number of land trusts to conserve land for public use. Some 2.2 million acres were developed in the U.S. between the years 2000 and 2005, while about 2.6 million acres were protected through conservation efforts. “The trend is even more dramatic in the West,” Jon Christensen notes in a report for Stanford University’s Bill Lane Center for the Study of the North American West. He reports that about 450,000 Western acres have been conserved in recent years, while 330,000 acres have been developed. The real “winners” in this race are Colorado, Montana, New Mexico and Wyoming, where more land was preserved than developed—the most dramatic figures come from Colorado and Montana, where preservation wins five to one. Helping the effort are new federal tax incentives for conservation that went into effect in August 2006. So far, Colorado is the only Western state with its own state tax incentives for conservation—an obvious reason it leads the West in the latest studies. “Conservation is arguably now a force that is on par with development in shaping the future of the West,” Christensen says. But he cautions that not all Western states are equal when it comes to preserving land, and notes six states—Arizona, California, Idaho, Nevada, Oregon and Utah—are still seeing more land developed than conserved. Meanwhile, state, local and private land trusts (protects land through conservation easements) have grown across the nation, but with the West once again leading. Then there’s what we like to call “ballot box conservation,” or voters putting their pocketbooks where their hearts are. In 2006, an astonishing 133 ballot initiatives across the country were approved by voters to conserve land worth $6.7 billion. In comparison, in 2005, $1.5 billion in conservation ballot initiatives was passed. Rand Wentworth, president of the Land Trust Alliance that conducted some of the studies, says the results took his breath away. Now for the bad news, courtesy of Richard Moe, president of the National Trust for Historic Preservation. In a speech he gave in Denver in 2006, he cautioned that the move by federal officials to put enormous tracts of western land under the stewardship of the Bureau of Land Management (BLM) is not always a good thing. He said it wasn’t until 1996, under President Clinton, that a national monument went to BLM rather than the Parks Service. Since then, it has become a trend, and 15 new monuments have been created within BLM. Some BLM land has been put into a special category—the “crown jewels,” Moe calls them—under the designation of the National Landscape Conservation System. But he finds little comfort in that designation. The situation is so dire that in 2005, the National Trust named the entire National Landscape Conservation System to its list of America’s Most Endangered Historic Places. The Trust’s call for help was heard by volunteers who love San Miguel, and they raised money towards its restoration. The doors of the historic part of the old mission convent, presently a museum, reopened on December 22, 2006, at 11:15:56 a.m.—the same date and time of the earthquake. The restoration project has six more phases to go before it is completed. Ten simple ways to preserve historic places. 1. Explore your family’s history. Show your kids the places where you went to school or where you got married. 2. Walk or bike. Getting out of your car allows you to appreciate the buildings and parks that make up the place you live, and you’ll be more likely to catch up with your friends and neighbors. 3. Shop on Main Street. Traditional commercial districts have appealing buildings and feature locally-owned stores that are vital parts of your community. 4. Tour your hometown. Visit a historic site in your area, stop by the local historical society or museum and attend the street fairs, ethnic festivals and neighborhood tours you’ve always meant to enjoy. 5. Read all about it. Every community has at least one book about its local history. Look for them at the local library (often a historic place itself) or at the historical society. 6. Entertain yourself surrounded by history. Attend a live performance or movie at a historic theater, or eat at a restaurant in a historic building. If you like the atmosphere, tell the owner or host. 7. Join an organization—even better, more than one—dedicated to preservation. Become a member of the National Trust online (nationaltrust.org), or find out about groups in your area. 8. Sleep in a historic place. Stay at historic inns and b&b’s; many of the best are members of the Trust’s Historic Hotels of America (historichotels.org). 9. Ask your neighbors about your neighborhood. Talk to people who’ve lived on your street longer than you have. Find out what they remember about living there and about the people who have moved on. 10. Visit some sacred history. Churches are often among a community’s oldest buildings; cemeteries reveal the fascinating lives of those who came before us. 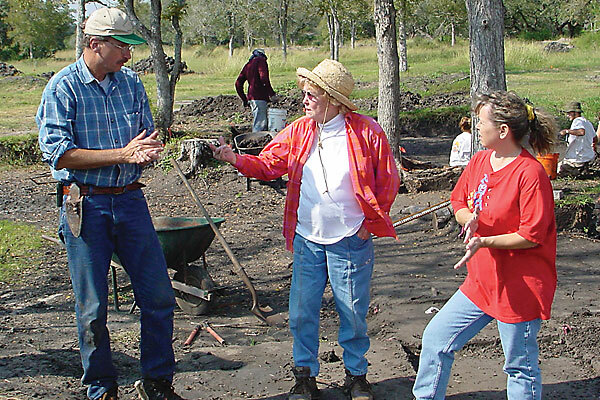 Nonagenarian archaeologist discovers La Salle’s fort.